Inflammation may act throughout all the systems in the body including the brain and contribute to many pathological processes. 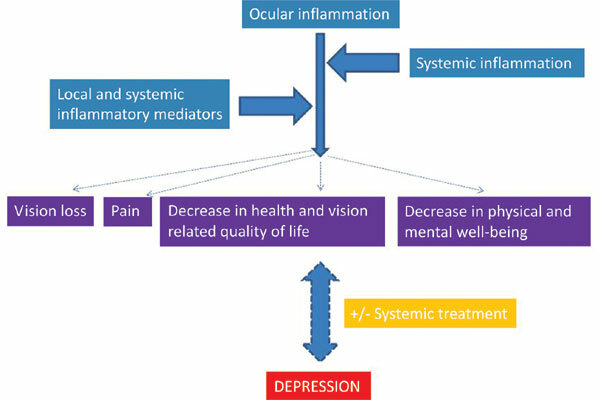 This mini-review starts with a brief overview of the literature in respect with the relation between ocular inflammation and depression. In addition, the discussion is mainly condensed on relevant studies about two ocular diseases: uveitis and dry eye. With this review, we aim to summarize the current evidence, potential mechanisms and to provide a clinical point of view to patients with ocular inflammatory diseases who may also be prone to concurrent depression and depressive symptoms. Keywords: Anxiety, Depression, Dry eye, Inflammation, Ocular, Uveitis. Keywords:Anxiety, Depression, Dry eye, Inflammation, Ocular, Uveitis. Abstract:Inflammation may act throughout all the systems in the body including the brain and contribute to many pathological processes. This mini-review starts with a brief overview of the literature in respect with the relation between ocular inflammation and depression. In addition, the discussion is mainly condensed on relevant studies about two ocular diseases: uveitis and dry eye. With this review, we aim to summarize the current evidence, potential mechanisms and to provide a clinical point of view to patients with ocular inflammatory diseases who may also be prone to concurrent depression and depressive symptoms.